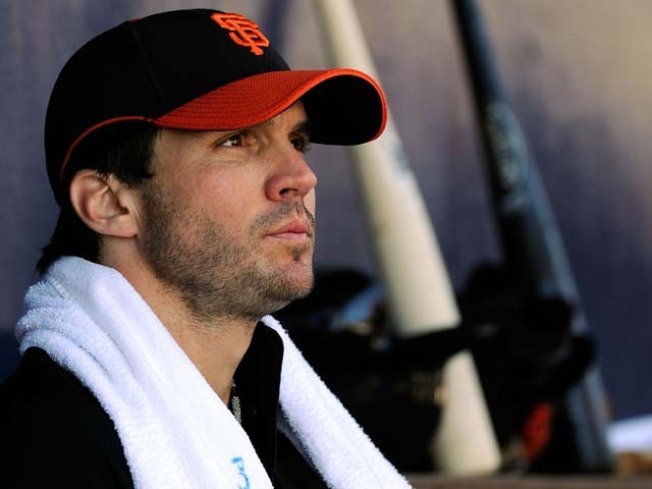 Barry Zito has been laying a couple of tracks in the studio. If you think the world could use yet another white guy playing acoustic guitar, then San Francisco Giants pitcher Barry Zito has a treat for you. A very, very, very bland treat. A longtime guitarist on the side, Zito has been spending some time in the recording studio working on demo tracks. A couple of them have been leaked on the Internet via The Dirty.com, who normally specialize in embarrassing pictures of athletes rather than exposing their embarrassing side attempts at being artists. Fans might say they would prefer him to practice his curve ball instead. Top 10 Manly Cities in the U.S.
TheDirty has posted an mp3 of a demo of Zito's track "A Man's Gotta Do What a Man's Gotta Do." His sound is not unlike Dave Matthews on about six vicodin. Hours later, a second Barry Zito demo track surfaced on TheDirty.com. This one is called "The Boy Next Door", a song mentioned in a 2004 interview Zito did with ESPN. That track, written by Zito, contains the hilariously clever lyric "You girls look at me like I just slept with your mother." I can see how an $18 million-a-year starting pitcher with a 7-10 record would get a lot of those kind of looks. Joe Kukura is a freelance writer who cannot wait until Barry Zito and Ron Artest record a duet.